I’m always losing my earrings. So I wanted a way to keep them nice and neat, but where I could see them all so when I need some, I can just grab and go. Like normal, I didn’t really want to buy anything new if possible. In this case I had to splurge on a frame. But it was only $5 at Michael’s. Otherwise, I had everything. But the only other really important material is the tulle. 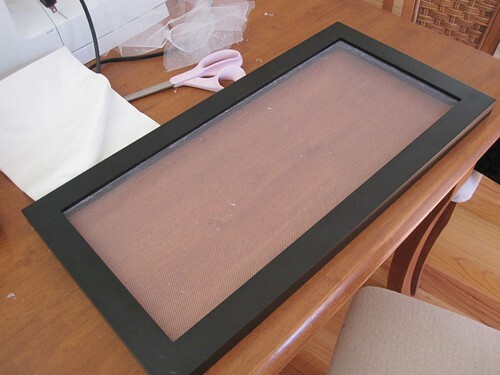 You only need enough to cover your frame which is probably less than $1. Keep reading for how to make this. Quick note about the picture frame. A shadow box would also work. You want something with some depth so that the earring backs have somewhere to go. Of course, feel free to get a more interesting frame than I did or decorate the one you get. Similarly for the tulle. Try different colors. They even have some with sparkle now! 1. 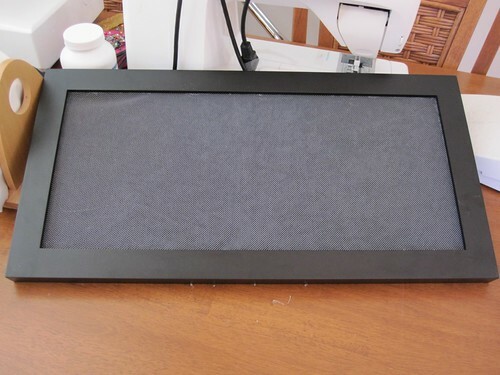 Cut a piece of tulle big enough to fit your frame. 2. 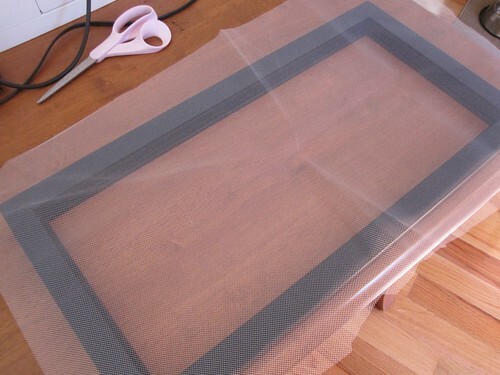 Glue the tulle into the inside of the frame. Be careful not to get glue outside of the frame. 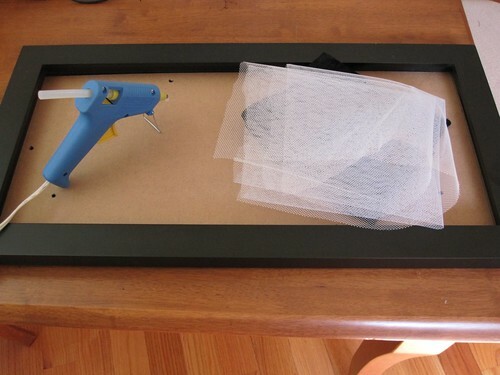 After you’ve glued it once, you can go back and reinforce with more glue. The nice thing about tulle is that it has holes so if you glue on the “outside” it will seep through the holes to hold it to the frame. 3. 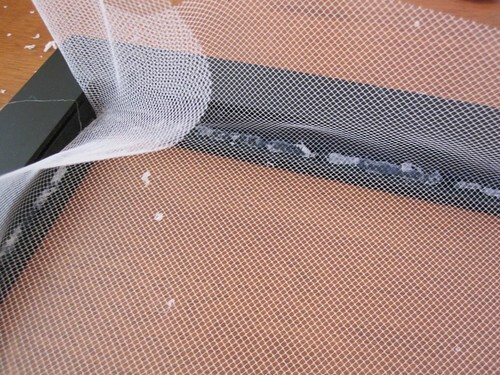 Trim your tulle and clean up any glue gun threads. You don’t have to do this part. You can just leave the whole thing open, hanging on the wall. That way you can use it with earrings that have backs. But the hooks for hanging my frame were on the back, so I decided to cover it and put it back in. 1. 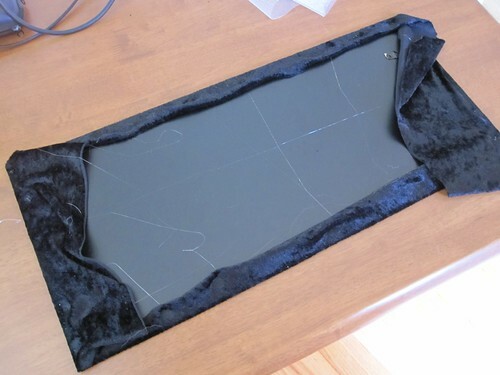 Cut a piece of velvet a bit bigger than your back. Lay your back on top of it. 2. Put a dot of glue in the center of two opposite sides. Pull your velvet tight and stick it to the those sides. 3. 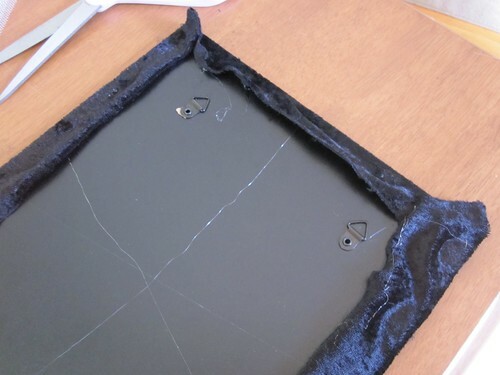 Put a dot of glue in the center of the other two sides. Pull your velvet tight and stick it to those sides. 4. Repeat with glue-pull tight-stick all around the edges, working your way towards the corners. 5. 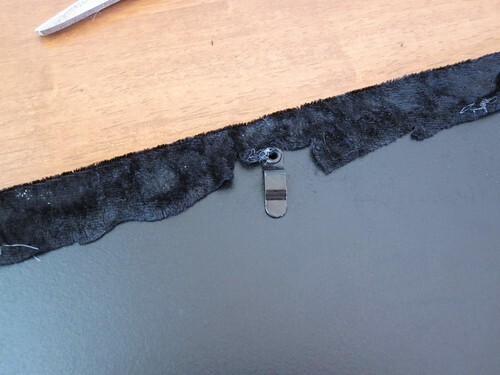 Trim excess velvet and glue down any spaces you left. 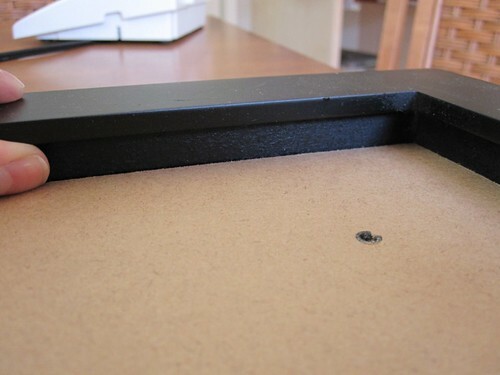 Be sure to trim around any hardware that is needed for putting the back into the frame. 6. Reinsert the back into frame. And you’re done! 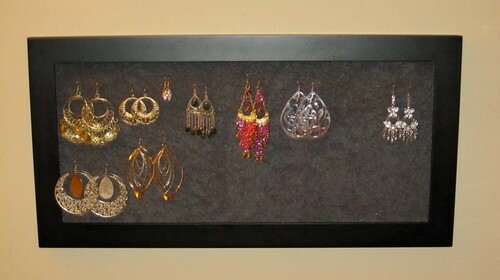 Hang on the wall and enjoy easy access to your earrings.